The Culture and Congress Center, often simply referred to as KKL by the locals, is the work of the French architect Jean Nouvel. It has an extraordinary presence among the more traditional buildings of Lucerne, especially due to the modern square shape and the enormous flat roof overhanging Europe Square. This floating roof, sometimes called the magic roof, soon became a symbol of the city and is definitely the building’s most prominent feature. Also remarkable is the successful fusion of nature and construction. The Culture and Congress Center almost merges with the adjoining water of Lake Lucerne and not only do the aluminum plates covering the surface reflect the light and ripples in the waves but the water also flows into the building itself and separates the KKL into its three parts. One part of the structure houses smaller halls and meeting rooms, offices as well as a bistro and an art museum, while the versatile middle part called the Lucerne Hall is the venue for bigger events, shows and conventions. The Culture and Congress Center’s main feature and the third part of the building is the huge concert hall. It has a lining made of maple wood, reminiscent of a violin case, but is popularly referred to as “Salle Blanche” due to the isolating side walls made out of gleaming white plaster reliefs. The blue ceiling is reminiscent of the starry night sky and the five floors beneath it, capable of holding 1,840 spectators, are furnished with plenty of pine, cherry and maple wood. 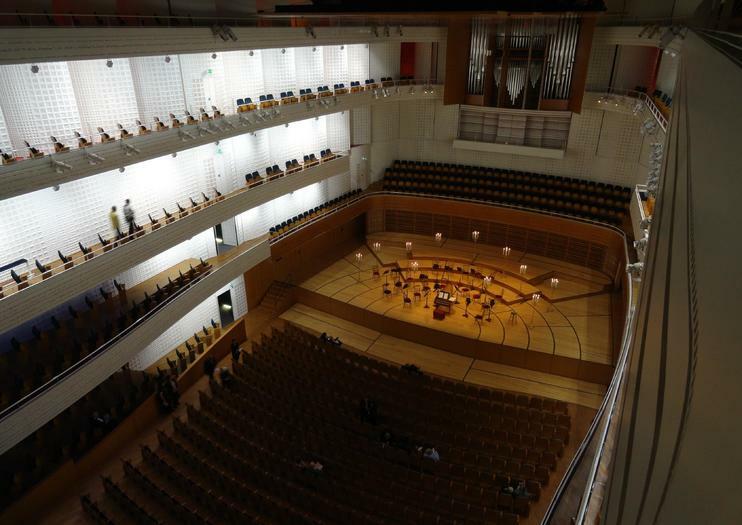 The concert hall was mainly built for classical concerts and thus, meets the highest acoustic demands, allowing for absolute silence in which sounds from the quietest pianissimo to the loudest fortissimo can develop. But among all the culture and music, don't forget to climb to the roof-top terrace for an incredible view over the city and Lake Lucerne. The Culture and Congress Center is located right next to Lucerne’s main train station, where every bus and train in the city makes a stop. The building is massive and simply can’t be overlooked. All the separate parts of the venue have different opening times and there are regular exhibitions and concerts taking place. Therefore, it’s probably best to pay a visit to their website to find out about the part you are interested in or join a tour that shows it all. Immerse yourself in the spectacular Alpine environment of Mt Titlis on a private full-day tour from Zurich. Ascend to the lofty summit of the natural landmark during an aerial cable car ride and then get up close to icy glaciers on the exhilarating Ice Flyer chairlift. Summon your courage to cross Europe’s highest suspension bridge and then enjoy a comprehensive sightseeing tour of Lucerne, a picturesque city surrounded by a mountainous perimeter. Relish the freedom and flexibility of this private tour, the itinerary of which can be tailored to suit your interests.